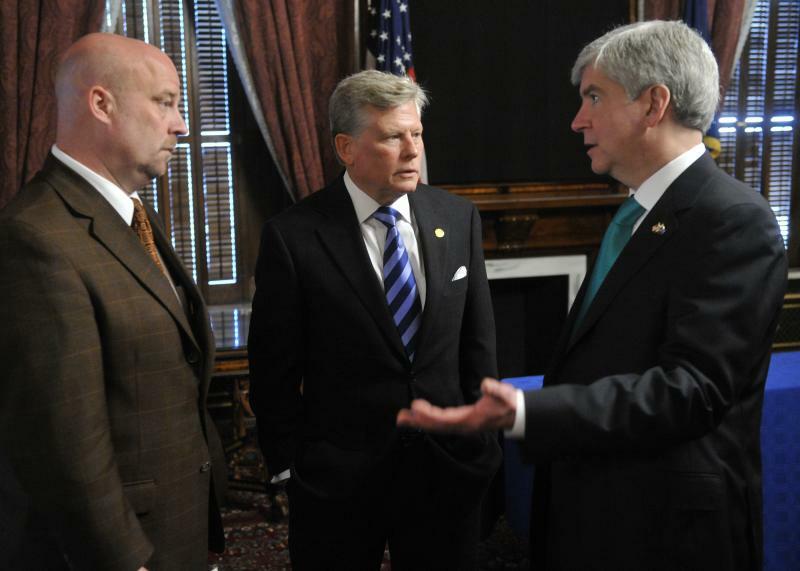 Michigan State Representatives Pscholka (left) speaks with Rep. Mark Ouimet (center) and Gov. Rick Snyder. Across the country, states are weighing competing funding priorities as they work to close gaping budget deficits. In Michigan, Republican Governor Rick Snyder isn’t just trying to erase $1.4 billion in red ink. He also wants to fundamentally remake the state’s tax code. Snyder says it’ll help reverse years of economic decline. Snyder says Michigan’s tax code takes too big a bite out of small businesses. The thinking goes if they pay less in taxes, they’ll have more money to expand and create jobs. "I pay taxes on the business, and then all of that income flow through to my personal income tax, and I pay tax on that again." Governor Snyder wants to throw out the state’s current business tax and replace it with a 6% tax that would largely fall to corporations. Most small businesses – like Wee Discover – wouldn’t have to pay it. Grub says if the Governor's tax proposal goes through as is, he'll end up "saving 8-9% of the tax" that he currently pays. The "boat out of poverty"
The tax cuts for small business would cost the state government about $1.8 billion in revenue. To help make that up, Snyder wants to add a tax to some retiree pensions, and end tax credits for certain businesses, like the film industry. He also wants to cut the state's Earned Income Tax Credit (EITC) for the working poor and replace it with a $25 per child tax credit. 28-year old Tiffany Blackman makes $20,000 a year as a coordinator at a Michigan Food Bank. Her husband Rodrico has been unemployed for a year and they have three kids. Tiffany says after they pay their bills each month, the family has about $60 left over. She says the money they get from the state and federal government helps. They use it to "keep us afloat throughout the year. Like our car repairs, anything with our children’s school clothes, anything like that is essentially coming back from any taxes we get back, any tax refund that we get back." "And over the last four years which we’ve been getting this earned income tax credits…I really feel like there’s hope in our finances. I don’t know if that makes much sense to people. But I do. I feel like there’s hope in the boat out of poverty." Michigan: a "relatively poor state"
Don Grimes is an economist at the University of Michigan. He says when the state first started to offer the EITC in 2006, Michigan was relatively wealthy and could afford it. "Now we’re a relatively poor state. So you have to wonder at what point Michigan has that responsibility to its population in terms of providing essentially welfare to the lower-income working people?" 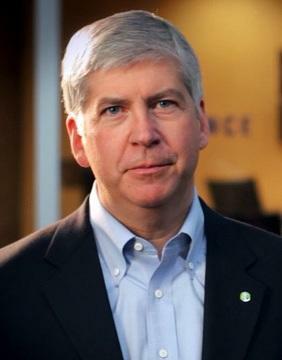 Snyder hopes the state’s lawmakers – the majority Republican – will pass his tax proposal ‘as is’ by May. 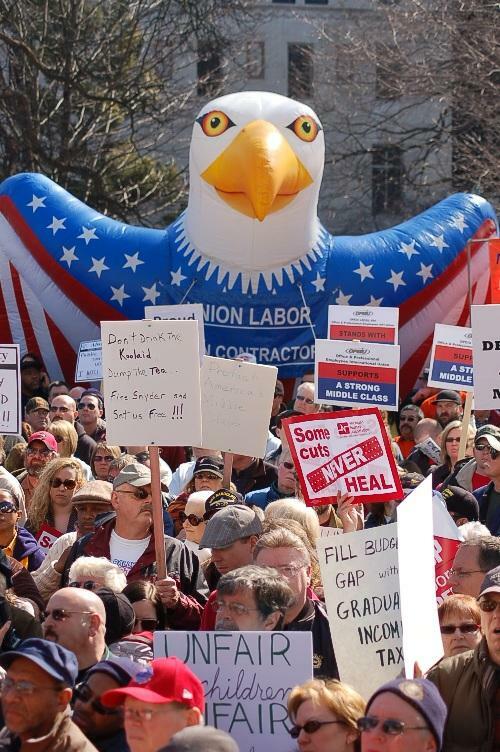 UPDATE: A growing number of angry labor-movement supporters are showing up at the state Capitol to protest Republican proposals to tax pensions and limit union control. A drum circle played on the Capitol lawn, surrounded by thousands of protesters with signs, a 15-foot inflated eagle, and flapping American and U-A-W flags. There were big, hulking men in hardhats, businesspeople in suits, and young parents pushing strollers. A group opposed to Governor Rick Snyder submitted language today for a recall petition. It’s the beginning of what may be a long process. The group, Michigan Citizens United, is behind the recall campaign. Gerald Rozner is the group’s spokesman. He says Gov. Snyder deserves to be recalled for signing legislation that gives state appointed financial managers broad powers to void city union contracts and plans to increase taxes on pensioners.